In honor of Tabitha turning 11 this week, here’s a conversation from 6 years ago. We have a little family tradition. When we go grocery shopping the weekend before your birthday, you can choose one box of any cereal you want-no restrictions. In the weeks and months leading up to the grand event, much time is spent in the cereal aisle weighing the advantages of the various sugar-laden options. The week before turning five, Tabitha nearly dropped the ball. She just grabbed the first box of anything at hand. I don’t remember what it was, but it seemed out of character for her. I reminded her of the cereals she had been coveting as recently as the previous week. She went for the generic Cocoa Puffs. I steered her towards the real deal. If you’re only gonna eat ’em once a year, you might as well have the sugar-addled bird bouncing off the box in front of you, right? Tabitha: Do I have Cocoa Puffs or Cocoa Puff in my hand? Me: Well, you have four Cocoa Puffs. T: [with only one in her hand now] Do I have Cocoa Puffs or Cocoa Puff? Me: You have Cocoa Puff. Me: [with empty hand displayed] Do I have Cocoa Puffs or Cocoa Puff in my hand? Me: Well…Is it Cocoa Puff or Cocoa Puffs? Me: Yeah. Isn’t that weird? If you have one, it’s Puff; if you have none it’s Puffs. T: No! I knew that; I was showing you that [you had zero] by not saying anything-zero words! Children listen carefully to language patterns. They do not learn a native language like a second language in school. The rules are not carefully explained to them one at a time. Instead they listen, speak, get corrected, and try again. All of this can be tremendously fun for child and parent alike. It is an odd quirk of English that zero is plural, grammatically speaking. We talk about having one child, but zero children. More commonly, we use no instead of zero, as in My neighbors have no children. The grammar is the same either way; saying My neighbors have no child sounds funny to our ears. In discussing place value, zero is sometimes called a place holder. To understand that, children need to understand zero as a number. They need to understand that zero can legitimately answer the question, How many are there? We talk a lot about zero in our house. You can too. Ask your children, “Would you rather have one cookie, two cookies or zero cookies?” Ask who has more of something, even when one of the people has none. Another silly language game we play in our house is this. If you look in the pantry and see that there are three cookies left, you can report this in the following two ways: (1) “I checked the cookies; there are three left,” and (2) “There are three cookies.” If, however, there are no cookies in the pantry, these two ways of reporting the sad fact become: (1) “I checked the cookies; there are none left,” and (2) “There are none cookies.” We like to treat none as a number. There is no good reason for this; it is for personal amusement purposes only. Tabitha again chose Cocoa Puffs on this, the week of her eleventh birthday. She is enjoying them, but she has also stated the obvious—they look like rabbit poop. Naturally, I bought some a few months back. I asked Tabitha (6 years old) and Griffin (8 years old at the time) what they thought. I started with Tabitha when Griffin wasn’t around so I could get her pure thoughts. I wanted to know why she thought that. I thought she might be mistaking side length for area. That is, maybe she was paying attention to the lengths of the sides of the two crackers rather than to the amount of cracker. So I asked about it. She pointed to the uncovered part of the BIG Cheez-It and argued that this wasn’t enough to make another full regular Cheez-It. So she was paying attention to the amount of cracker. A few minutes later, it was Griffin’s turn. He ran like a chipmunk with his two crackers into the dining room. I imagined that this chipmunk would be nibbling the crackers next door and that our conversation would be at an end. 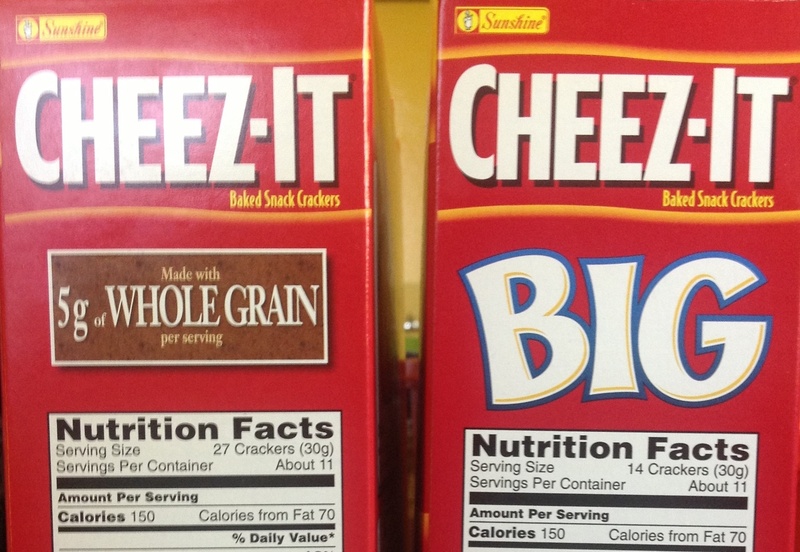 His conclusion: BIG Cheez-Its are almost but not quitetwice the size of the regular Cheez-Its. Notice the differences between the children’s strategies. Tabitha, the six-year old, worked with the crackers. 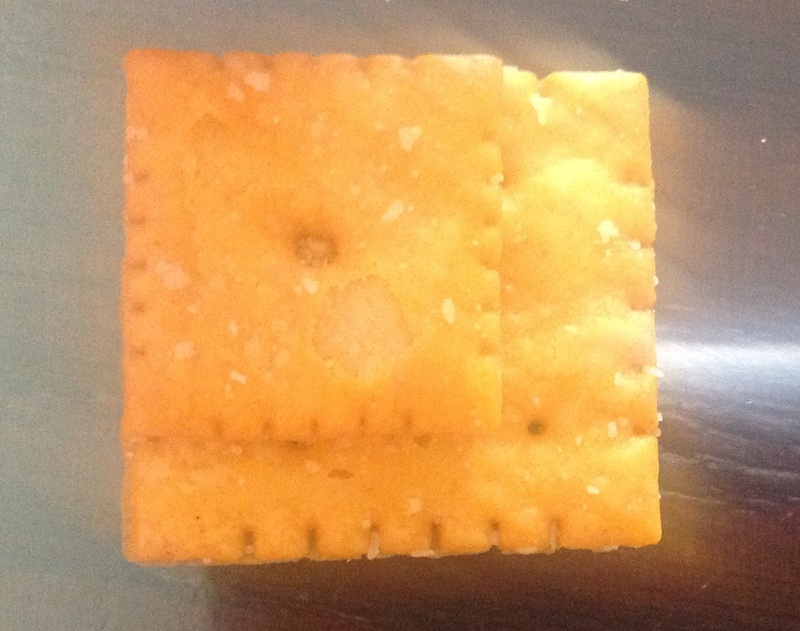 She put one cracker on top of the other and tried to picture whether the leftover space made up a whole cracker. She was very concrete in her thinking. Griffin, the eight-year old, worked with representations of the crackers. 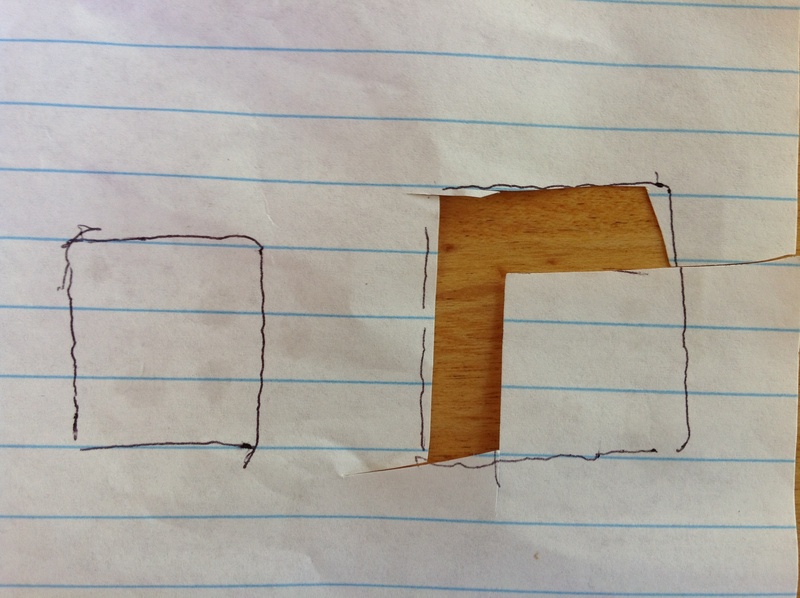 He traced and cut out squares of paper which he could manipulate with more precision than the actual crackers. The two children reached similar conclusions. Knowing whether one cracker is twice as big as the other does not require measuring how big either cracker is. All of this is very typical for young children. Younger children tend to work with the actual things they are comparing. They are what we call concrete thinkers. Older children begin to work with representations of the things (e.g. Griffin’s cut outs). They are more likely to be abstract thinkers. Investigate advertising claims. Have a healthy, skeptical attitude towards these claims, and encourage your children to wonder about them, too. Be forewarned, though! You may create critical thinkers who question your authority, too. And you may end up spending a LOT of time trying to figure out whether Double Stuf Oreos are really doubly stuffed.